When you look for a tour in or around Frankfurt, Germany there is a wide range of activities and trips available. From a quick guided city tour to day trips and extended excursions, there are many things to do in Frankfurt and the surrounding areas. Whether you stay only one day, or make Frankfurt your base to explore southern Germany, here you'll find tips to get the most out of your vacation. 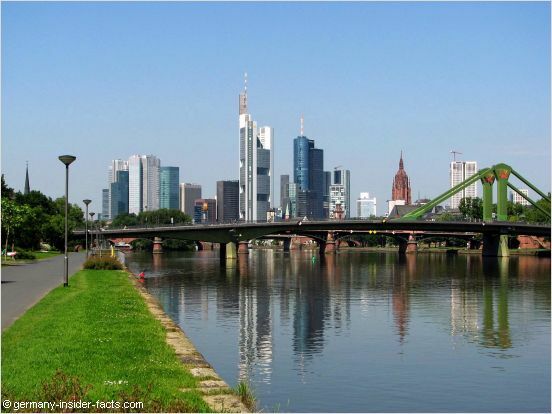 Known as an international centre for finance and commerce, Frankfurt also has a high quality of living. There are many attractions within the city, others are easily reachable on a day tour. With Germany's largest airport at the edge of the city, Frankfurt is the place where most visitors from overseas arrive. So why don't you stay a couple of days in this bustling city? The main sights in the city centre are fairly close to each other, so you can walk from Hauptwache to the old town and the river Main. However, at the end of the day you'll have done quite a bit of walking. Public transport in Frankfurt is pretty good. It is no problem to reach all attractions by bus, tram or S-Bahn, or a combination of all. Buy a Tageskarte (day ticket) or Gruppentageskarte (day ticket for groups/families up to 5 persons) and off you go. But it can be a bit tricky to find your way around with public transport when you are new to the city. So a guided city tour or the hop-on bus might be an interesting alternative. Compile a list of things you want to do in Frankfurt and compare the options below for your personal Frankfurt sightseeing tour. A "Hop on - Hop off City Tour" is a great way to explore a large city, especially for first-time visitors. Get off at any of the 14 bus stops which cover the main sights, explore the attractions, and continue with the next bus. It is that easy. Audio guides (surcharge) are available in several languages. The blue buses start every 30 minutes from the main train station (Hauptbahnhof) and Paulskirche / Berliner Straße. When you start at the main station, there are first several stops in Sachsenhausen on the southern side of the Main. Back on the northern side of the river, you can get off at the stop Eiserner Steg to discover the cathedral, the old town around the Römer (town hall) and Paulskirche. Hop on the bus again to sea the banking area, the old opera, the botanical garden, Senckenbergmuseum and the fairgrounds. Get off the bus wherever you want. The first departure in the morning is at 9:15, the last departure is 5:15. Tickets are valid all day. If you don't have a full day available, a guided city tour with the red open-top bus is another option. 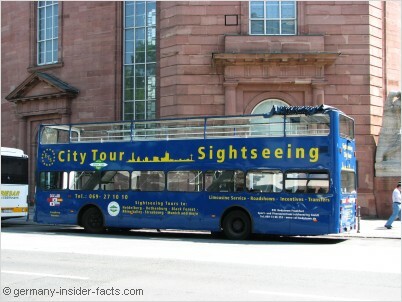 The two hour Frankfurt city tours run at 10 am, 1 pm, 4:30 pm and 8 pm. Enjoy Frankfurt's stunning skyline aboard a cruise ship on the Main River. I love the scenery along the river, the beautiful old houses opposite the city on the Museumsufer, the cathedral and historical museum, the skycrapers and the green river banks. You will see all this from a tour on the river. This one-hour cruise is a great way to relax. The onboard audio commentary (English) tells you about history and the highlights you are going to see. Choose from five different departure times to fit the cruise into your Frankfurt itinerary (March to October only). When the Christmas market is running in December, there are tours on Friday, Saturday and Sunday. 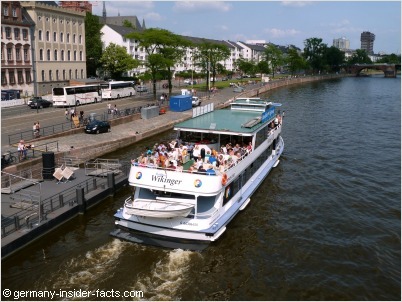 Cruises start at Eiserner Steg opposite the historical museum, close to the city centre. Use public transport worry-free, you always have the right ticket with this card. This super-saver Frankfurt card is valid on buses, trams and S-Bahn trains within the city (travel zone 50 and 5090 to the airport). Additionally, you'll get 50% discount on entry fees for 24 museums, the Palmengarten and the Zoo. The Frankfurt card is available for 1 person for one or two days. The group card (up to 5 persons) is a great option for families or a group of friends. When your time in Germany is limited and you are looking for one-day tours to see more than just the city, here are a few tours you might enjoy. There are quite a few places that are definitely worth a visit. Historic cities & towns, castles & architectual treasures are plenty within the reach of Frankfurt. Traveling with kids? A day trip to Phantasialand theme park in Brühl, is a must do. I am pretty sure the kids (and adults) have fun. Discover the pearl of Germany's medieval towns on a day trip from Frankfurt. Beautiful half-timbered houses, old town gates, towers, Jabobskirche with its famous altarpiece by Tilman Riemenschneider... this and much more awaits you on this tour. 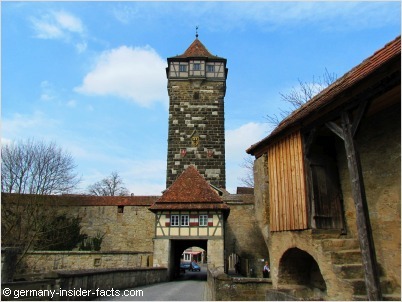 Explore the old town of Rothenburg with an expert guide and learn about its century-old history. When you go in December you will see the enchanting Christmas market (called Reiterlesmarkt) on the market square. This tour operates daily at 9:30am. 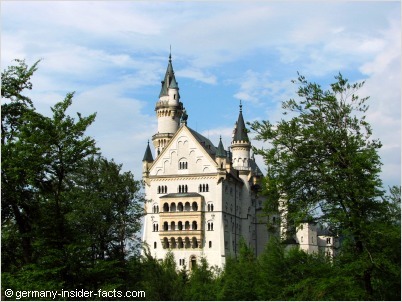 King Ludwig's fairy-tale castle are on the to do list of many travellers to Germany. If you are short of time, and really want to see Neuschwanstein, this is the tour for you. Travel in a comfortable coach or minivan down south to Füssen. Upon your arrival at Neuschwanstein castle you'll join a guided tour (operated by castle staff) of the interior to see the beautifully decorated halls. There is also time to explore the castle grounds on your own. This tour operates daily at 8:30am. Entrance fee for Neuschwanstein and a lunch box is included. Be prepared that this will be a long day and a lot of driving, but if this is your only chance to see these castles go for it. When you look around this website you can certainly tell that I love Germany's southern areas. Sure, the north is nice as well, but southern Germany definitely is my favourite holiday playground. Believe me, the destinations covered by these tours are really worth a visit. Visit Heidelberg with its romantic castle & the beautiful old town on the Neckar river. The splendid scenery is hard to top. 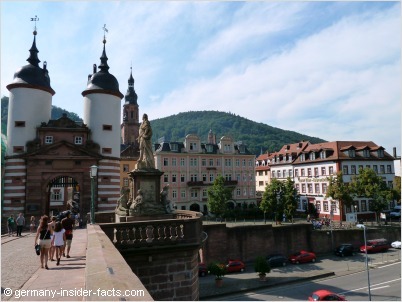 The idyllic old town, the stone Neckar bridge, and nestled in the hills - the famous Heidelberg castle ruin have fascinated romantic souls for centuries. You will fully understand why Heidelberg inspired many writers and painters. There's even a song "Ich hab' mein Herz in Heidelberg verloren" (I've lost my heart in Heidelberg). Explore the castle, see the world's largest wine barrel & enjoy beautiful views over the old town and the Neckar. This tour can be booked as morning tour (9:30am departure) or afternoon tour (3:30pm departure). This is a perfect tour for anyone interested in medieval castles. 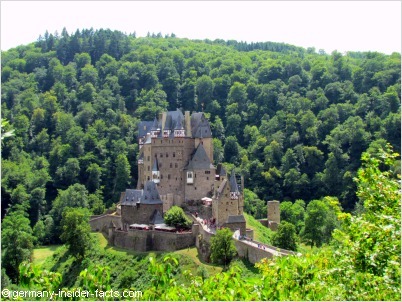 Travel by coach from Frankfurt towards the Mosel valley and further to the majestic Eltz castle. Explore the history and treasures of a family-owned castle, built in the 12th century. For centuries 3 lines of the Eltz family lived in the castle. Each branch of the family built their own family homes within Burg Eltz. 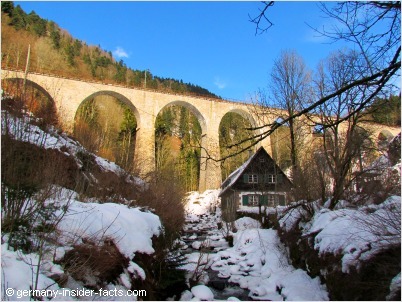 Enjoy the stunning location of the castle on a hill near the Elzbach valley. On the way back to Frankfurt, you stop for dinner in a German restaurant on the banks of the Rhine. The tour operates daily from 1st April to 1st November. Enjoy a full day along the lovely middle Rhine valley, an area listed on the UNESCO heritage list. See ancient castles nestled in the hills, picturesque wine villages, the famous Loreley rock and the Niederwald monument. An optional cable car ride up to the Niederwald Denkmal surprises with stunning views during the summer months. 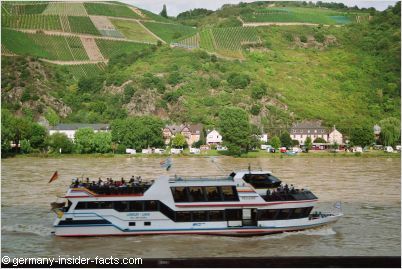 Lunch, wine tasting and a river cruise on a Rhine steamer are included in this fantastic tour. Please note: The itinerary might change depending on the time of the year. If you are really short of time, there is also a 1/2 day Rhine valley trip from Frankfurt available. Stunning scenery, ancient towns, the most romantic castles, culture and fun awaits you while travelling with your personal driver & guide to the most famous or hidden destinations in southern Germany, or to any places You choose. Is travelling with 20+ strangers in a bus not your cup of tea? Then you should consider a customised, private tour for your vacations in Germany. A tour with your private driver and bilingual guide is not as expensive as you might think. Especially multi-day-tours for a family or group of friends have fairly competitive prices, and the longer the tour is, the better the quote per day. Enjoy a worry-free trip. Your guide takes care of your accommodation, entrance tickets and much more. Sure, your freedom to go off the beaten track is slightly more expensive than a commercial tour. But isn't your once-in-a-lifetime tour worth an extra dollar? Take your time! Plan about 8 to 10 days for this tour, spending more time is never bad! Let your guide show you the secret places between the listed highlights. This tour is only an example what you can see during a tour in southern Germany. Add the places YOU want to visit, skip those that don't interest you. Work out your perfect itinerary with your personal tour guide. You can book a tour like that everywhere in Germany all around the year! Many commercial tours won't operate in winter, so a private tour can solve your problems. Use the contact form above to get a quote!